Diodes are electronic devices having the property of unilateral conductivity. Previously widely used vacuum and gas diodes. Now, when talking about the diodes, that usually mean solid state. The property of unilateral conductivity of the diode is widely used for rectifying the current. There is a General rule – to correctly solder the diode, it is necessary to consider the polarity, otherwise it will not work. LEDs are usually long leg connected to the positive electrode (anode) and negative (cathode). The other diodes anode marked with a beveled corner, and a cathode – sign "-". However, relying on this is impossible, because not all manufacturers mark so the electrodes are semiconductors. Take an ohmmeter or multimeter in the ohmmeter mode, measure the resistance of the diode. In the forward direction when attached to the anode " + " and cathode "-", the resistance of the diode is 0 in the opposite – very large. Once accurately determined the polarity of the diodes, you can solder it into the circuit. Take the diode with tweezers. Warm up the soldering iron, dip the tip in flux and swipe the legs of the diode, then dial the tip in a little solder again and swipe at the legs – saladita them. Insert the diode into the place prepared exactly in accordance with the polarity. If you soldered a few diodes, place them so that the cathodes were in the same row, and the anodes in the other. In order to lock the pieces on the Board, spread insights from the electrodes in different directions. If the legs are too long, trim them with wire cutters. Dial on tip of a soldering iron some solder and apply it to the place of contact. After the solder begins to melt, move the soldering tip for soldering to apply solder to the solder surface. When soldering LEDs, you must consider their sensitivity to the current load. To limit the current in an electrical circuit in series with the led include a resistor. Calculate the resistance based on maximum allowable current for the LEDs. Do not warm up the soldering iron soldering more than a couple seconds, or the diode can fail. In the manufacture or repair of electronic devices essential in ensuring reliable operation of soldering is correct. And if soldering the resistors and capacitor is relatively simple, when soldering transistors should follow some important rules. For soldering of electronic components use a soldering iron with a capacity of no more than 60 watts., optimal power of 40 watts. The tip of the soldering tip sharpened so that its size allowed to solder individual legs of miniature transistors. Quite comfortable the width of the tip of 3-3,5 mm. 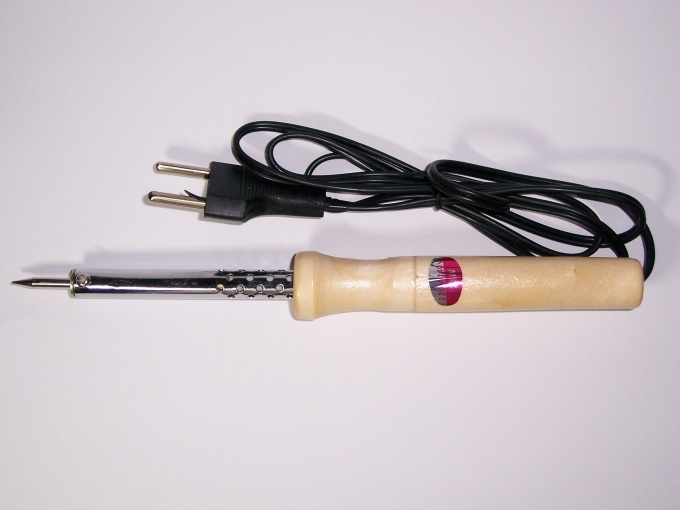 it is Useful to have a few soldering irons, featuring the power and sharpening the tip. Soldering of bipolar transistors requires special precautions. However, try not to overheat their insights, time, touch the soldering iron to the legs of the transistor should not exceed 3-4 seconds. If you soldered the transistor is punched, heat the soldering iron holes insights and a needle make a hole in the molten solder. Carefully insert the legs of the transistor in the made holes and propagte each leg. Closely monitor the quality of the soldering. The so-called "cold" soldering, i.e. soldering is not fully warmed-up solder, it falls unevenly, in lumps, has an ugly gray color. If the contact area around the holes for the withdrawal not honored or greasy, the solder won't lay down smoothly. Therefore, before soldering will saludito the contact area, it should be covered with a thin smooth layer of solder. As a flux, use a solution of rosin in alcohol. For the preparation of flux take a small bottle of nail Polish, it is very convenient brush. Will macrosite up to half of the rosin and pour ethyl alcohol. Wait until the resin dissolved. If you work carefully apply flux with a brush on the soldering. Pike field-effect transistors requires special precautions. Such transistors are afraid of static electricity can ruin them just by touching one of the conclusions made by hand. The soldering iron should be grounded when soldering to disconnect it from the network. 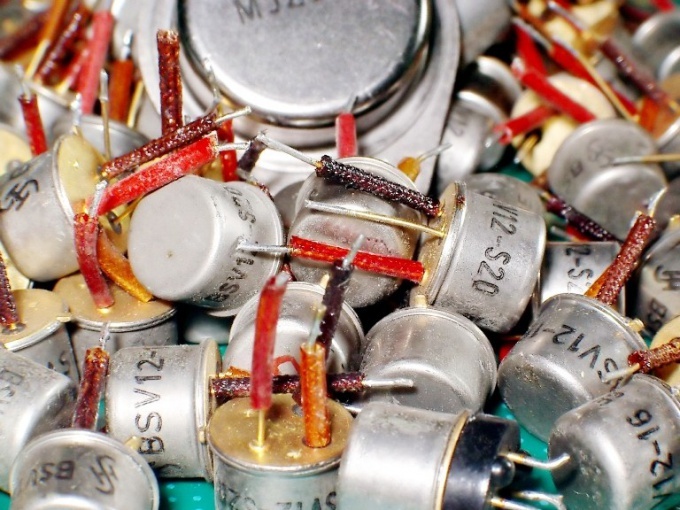 Before you take on the transistor, touch a grounded soldering iron. Even better to wear on the hand with a metal bracelet connected to the ground – for example, the radiator. Before soldering, touch a grounded soldering iron pads boards and then insert the transistor. The transistor take over the case. Before soldering wrap his legs with a thin bare wire. While the legs of the transistor are connected, the static electricity is not threatening him. After soldering carefully untwist the wire with tweezers and remove. Instead of procrastinating, you can use a piece of ordinary food foil pierce her legs of the transistor, and then, after soldering, remove. Ensure that between the terminal left of the piece of foil.